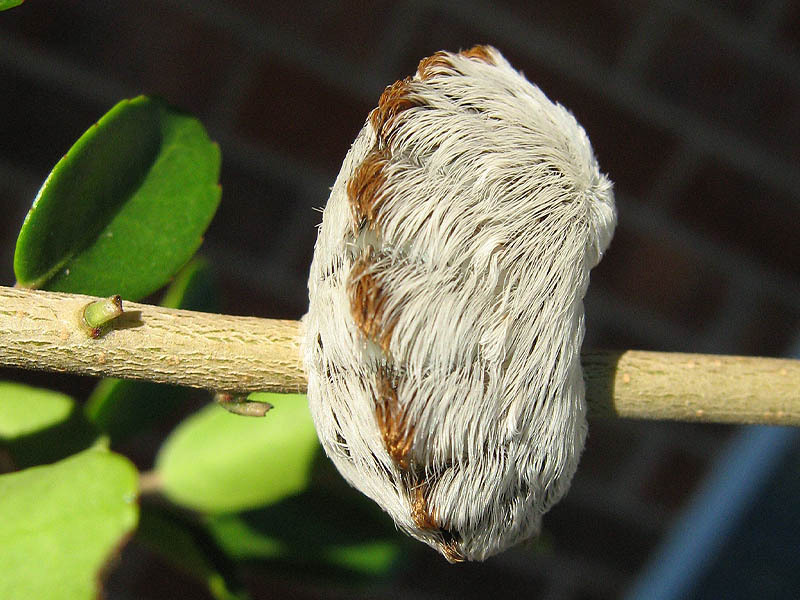 This is a Puss Caterpillar, the larval stage of the Southern Flannel Moth. This caterpillar is also known as the Tree Asp or Asp Caterpillar. It is so named because of the vicious sting it is reported to give. 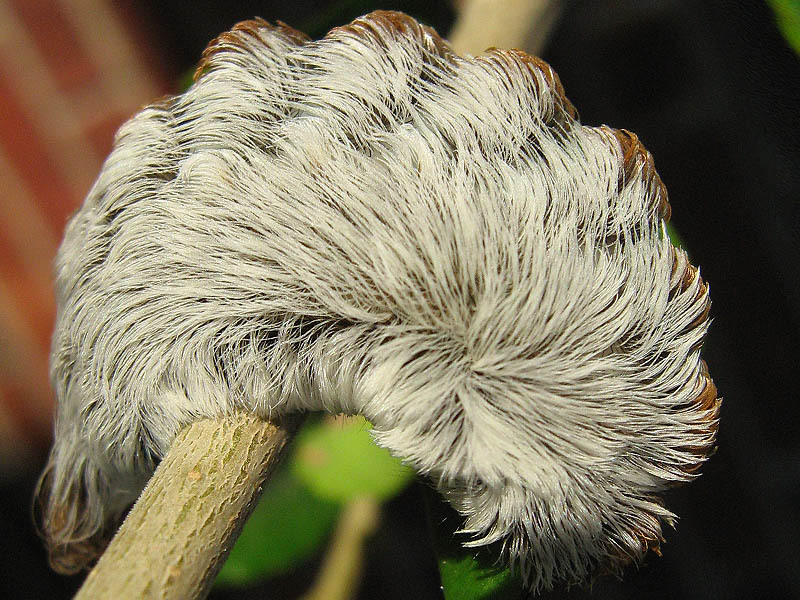 The fur of this caterpillar contains numerous venom releasing spines that can cause severe reactions in people. Radiating pain and burning, nausea, swelling, rashes, blisters, and difficulty breathing have all been described by people who have been stung by these caterpillars. These critters look furry and sweet, but if you every come across one, please use extreme caution. This was the first specimen of a Puss Caterpillar I had every encountered. I did not even know such a creature existed. My instincts served me well, though, and I avoided touching the caterpillar. Instead, I put the caterpillar in an acrylic container along with some leaves from the holly plant I found him on, and placed the whole thing on the bookshelf in my study. The caterpillar fed voraciously, and quickly soiled the container. 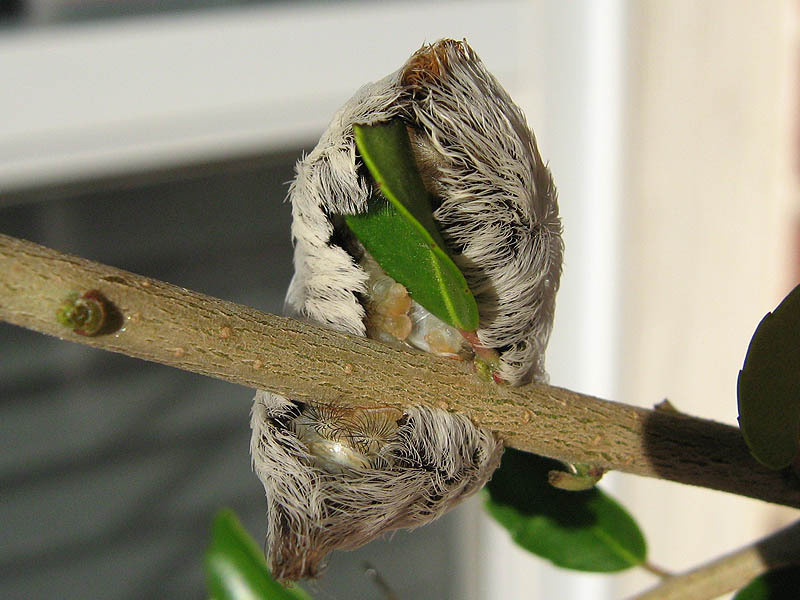 Six days later, strands of silk in the enclosure indicated that the caterpillar was ready to pupate. The next day, October 26, the caterpillar was fully enclosed in a silken shroud. 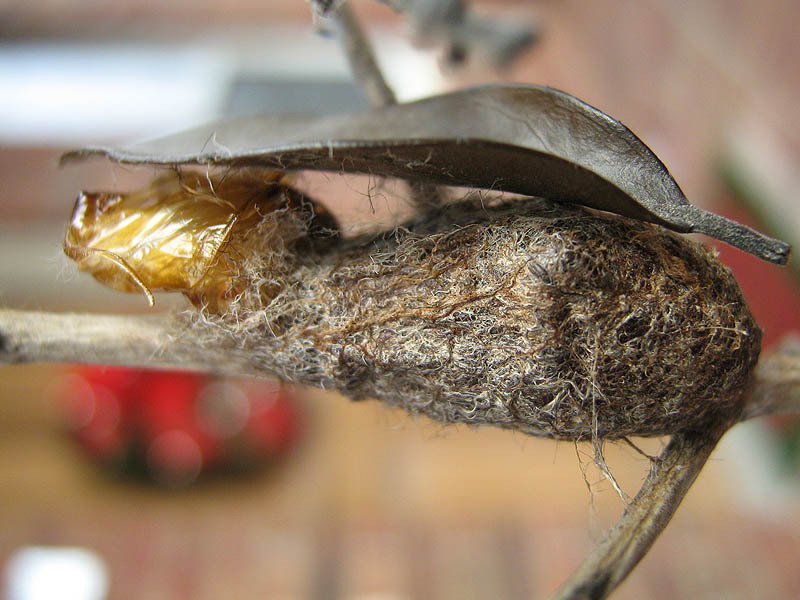 On December 13, roughly 43 days later, an adult female Southern Flannel Moth emerged from the cocoon. The newly emerged Flannel Moth. Another look at the vacated cocoon. The female moth is distinguishable from the male by its antennae. 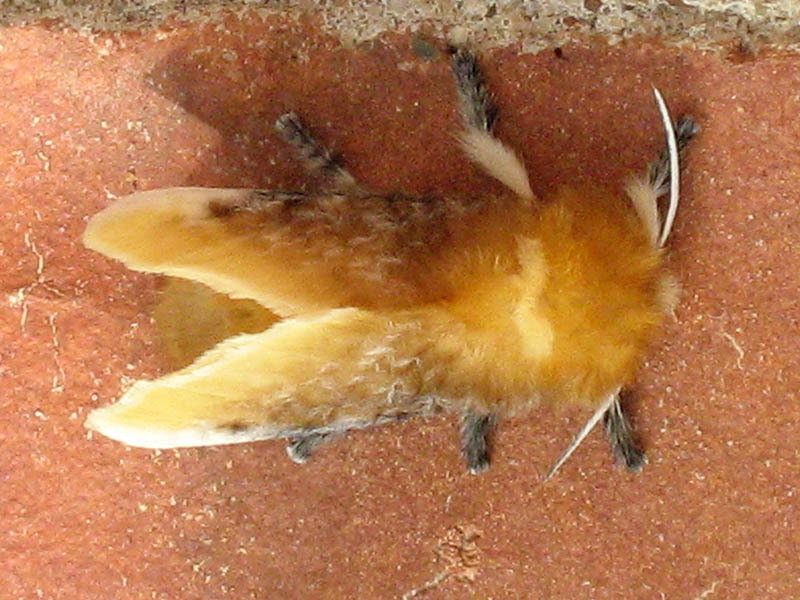 Male Southern Flannel Moths have plumose (feathery) antennae. On December 14 the moth began laying eggs. She died eight days later after laying several hundred eggs. 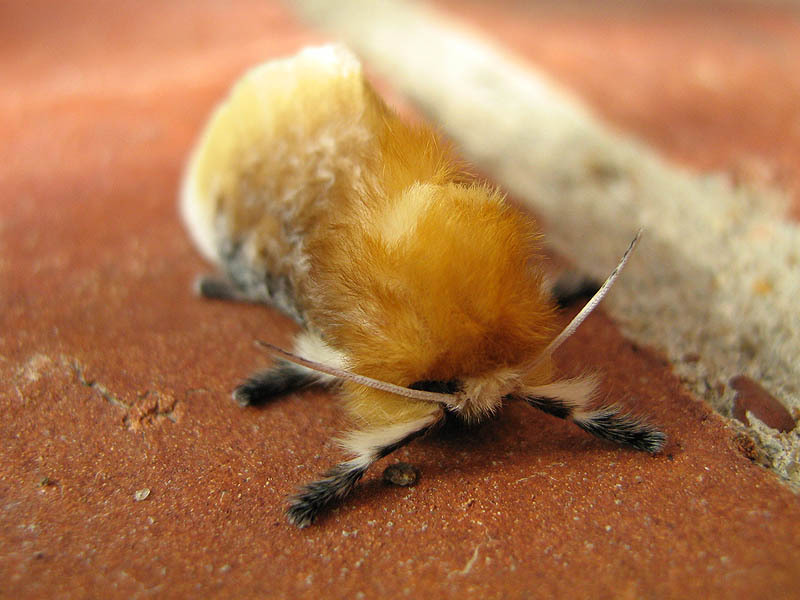 It is not clear if the adult moth can be expected to deliver the same kind of sting as the caterpillar form. Maybe one of our readers can fill us in on this detail. Eurasian Collared-dove – How Many? My dwarf yuopon holly (40 ft) I thought were dropping leaves from stress. However, they were infested with puss caterpillar. I found out the hard way. I had unknowly squashed one under my hand. It hurt unrelentingly for 12 plus hours. I have hit my hand with a hammer and it was never this bad. The pain was radiating up my arm. 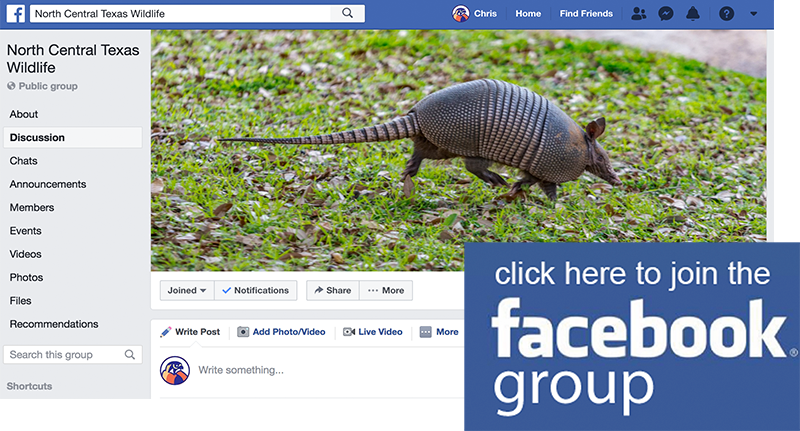 Thanks for your posting. I have been trying for days to figure out what they were. I sent a picture to A&M. Wow! I’ve heard the stories. Its hard to believe something that will give a sting like this isn’t more generally known about. I’d wager most people have never even heard of these caterpillars! They not only occur on hollies, but also on Southern Sugarberry (locally called Hackberry) and elm, and can be extremely abundant. When I was in ninth grade at Long Jr. High I brushed my right hand through a hedge beside a walkway while delivering newspapers. A few minutes later my hand felt like it was on fire. It swelled to more than double its normal size, and the pain went up my arm into my armpit, which felt like it was burning. It also ached and throbbed. My hand continued to pain me severely. When I got finished delivering the newspapers I went home and went to bed. I was in the band, and was supposed to play that night at the football game. My mother wrapped my hand with warm oatmeal poultices and gave me aspirin. By early evening the swelling and pain had subsided, and I was able to go to the game and play my clarinet. I never want one of those on me again. Yep. To be avoided at all cost! What beautiful pictures! My four year old daughter had an encounter with one of these today. She thought it looked cold and held it in her hand to warm it up. Within a minute or so she began screaming hysterically. I wasn’t sure if it was four year old drama or if it really hurt. Her hand became very red and was hot to the touch. After some benadryl and snuggles with mommy she settled down. I had never heard of these before, but like you mentioned my instinct was not to touch it. I should have listened to my instinct and not allowed my daughter to hold it. Thank you for the information and beautiful pictures. Well, that is terrible! So sorry that happened to your daughter! I have commented before that I think it is amazing that something that can produce such a painful sting is not more commonly known of in the area. Spread the word! We don’t want anyone else getting stung by these little devils! I’ve been having these guys on my front lawn since last year, but never once saw the adult form in person until yesterday. – a large female and a small male. I’ve heard that the adult moth doesn’t sting, so they were captured by hand, and placed inside a Critter Keeper container. The female laid eggs inside the container last night, but both will relocated to the local nature park today. I’m surprised to hear you say that most people don’t know about the asp. I learned as a child never to touch those things. Maybe with all the insecticides, they’re not as abundant now? Regardless, all young people should be taught about this caterpillar. I’m so glad I found out what this hairy bug was!!! I found one at the daycare I work at today! I stepped on one last Fall, it felt like a flame was being held to my foot, for hours. I had no idea what it was until the swelling went down and the tell tale pattern was visible Read much later about putting tape over the area and pulling it off to remove the stinging hairs. I tried numerous things to relieve the pain to no avail. Finally soaked my foot in a tub of warm water with a couple of cups of Epsom Salt dissolved in it. It stopped the almost unbearable pain and burning. Sweet relief. Did this moth have a chance to mate before laying all those eggs? To answer the question of whether that moth had a chance to mate before laying all those eggs — I don’t see how it could have laid the eggs without first having mated. Doesn’t it require the male to fertilize the eggs before they’re laid? 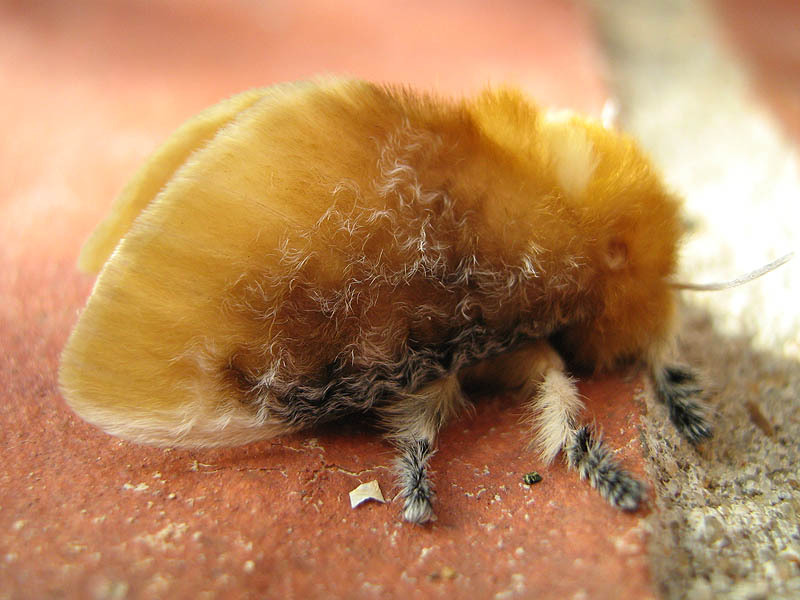 On another question, I have always wondered if the adult flannel moth could also sting, like its larvae do. I think I read somewhere that the adult can sting, too, but I’ve also read that they don’t. Anyone know for certain? I think I had this moth and picked it up by its wings and back area. The fur on the moth did not sting me. I understand certain moths, although come in male and female forms can also asexually reproduce. Luna moths can do this, they say. I wonder if the puss moths can also? I think I had this moth and it also laid eggs without having a mate. 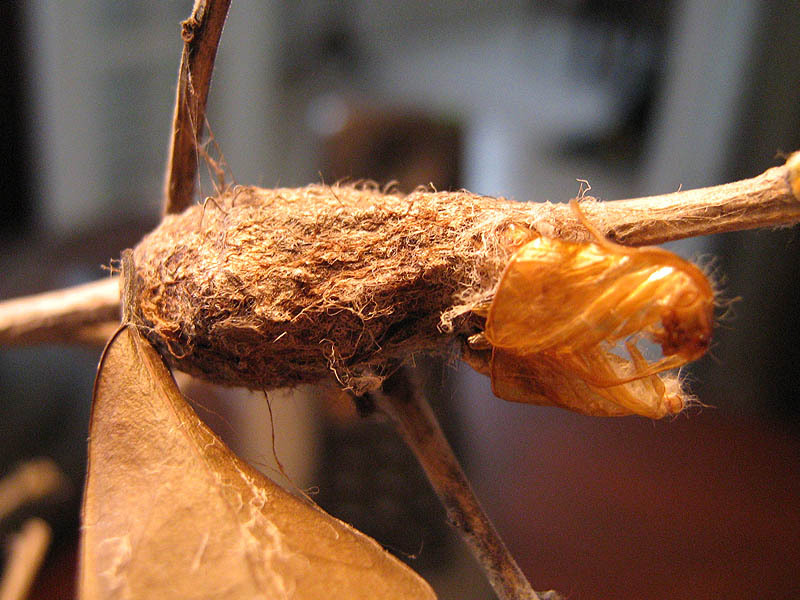 We found the chrysalis and put it in a jar thinking it was a mantis egg case and we’d get mantids in a little while. 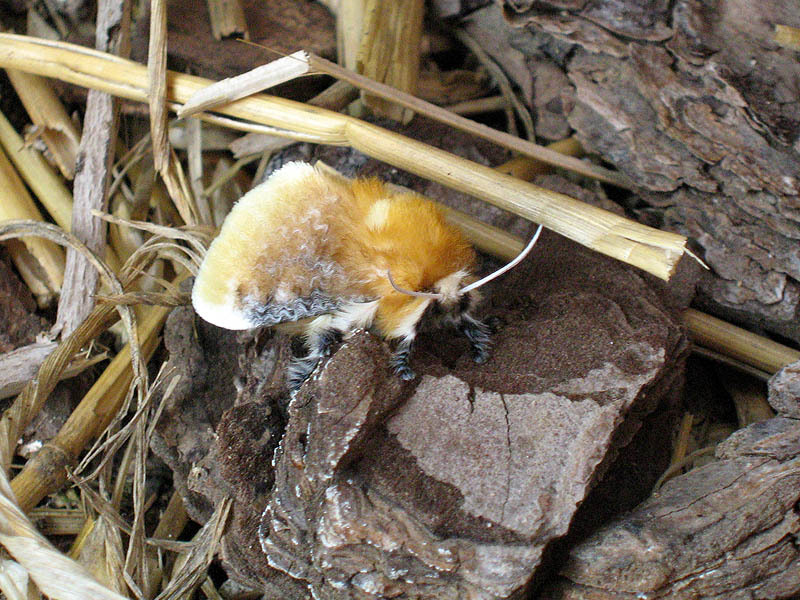 A couple days ago, I found a furry orange moth had emerged and was busily laying eggs. I set it outside, it laid more eggs and flew off. 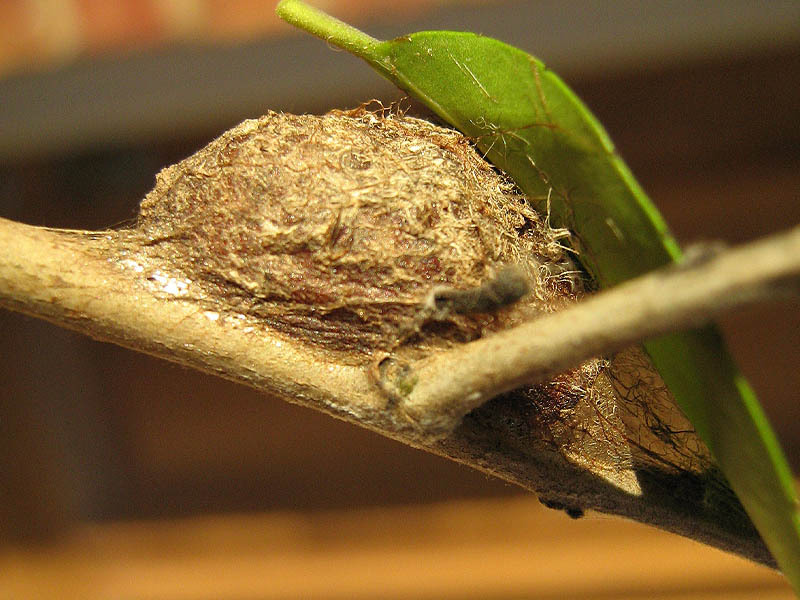 The eggs are furry, similar in color to the moth and in one place are laid in a round mass and on another side are laid in a u-shape. Now I don’t know if I want to keep these or not. I’ve been stung as a child by one of those and I certainly don’t want them to hatch in my house or yard! Thank God I have never seen one …. I live in Jacksonville, Fl … What’s so weird to me is that when in the caterpillar state then look so pet-table and soft …. I’m 78 …. and things just keep getting more WEIRD !!! Cellophane tape is recommended as first aide when stung. If the pain radiates into chest and shortness of breath….seek emergency treatment. Unless you KNOW what species of caterpillar it is NEVER touch it. It’s usually the most beautiful ones that are the most venomous. I live in Mississippi and captured my first asp last week. I’m 67 and very active in the woods and garden. I’m wondering if this one could be the only one on my 5 acres, if eggs are laid by the hundreds!?! The stinging hairs are on the bottom besides the feet and on the tip of the tail. If you encounter the hairs, find some tape, put on the sting site, and pull off. This will remove the stinging hairs. You may have to repeat this several times. You can actually touch the hairy backs. As kids we use to have pus caterpillar fights and learned to apply the tape quickly. Have one above our front door. I just realized what it was. I am in far east fort worth. It has been moving around the top of my front porch for days.